For most of its history, Seattle was a tightly segregated city, fully committed to white supremacy and the separation or exclusion of those considered not white. Here we map the neighborhood-by-neighborhood distributions of African Americans, Asian Americans, Native Americans, Latinos, and Whites across nine decades. Scroll down to view maps with short summaries of decade- by-decade changes. We also provide interactive maps and data that allow you to see the population mix of each neighborhood and filter for particular populations. Click the model interactive map at right. The map-essay below starts with decade-by-decade displays of the residential patterns of African Americans and Asian Americans/ Pacific Islanders. Continue further for maps showing Native American, Hispanic/Latino, and White population distributions. These maps are based on Tableau Public interactive maps created by Anna Yoon, Brian Lam, Gihoon Du, Jiang Wu, and Yurika Harada using data and shape files from the National Historical Geographic Information System (NHGIS). The work was a class project for Geography 469 GIS Workshop taught by Professor Sarah Elwood-Faustino Spring 2017. Page design and summaries are by James Gregory. Click the map above to explore an interactive map that allows you to see King County residential distributions for many ethnic and racial populations decade by decade. Additional race and segregation maps. Here are two sets of historic maps. 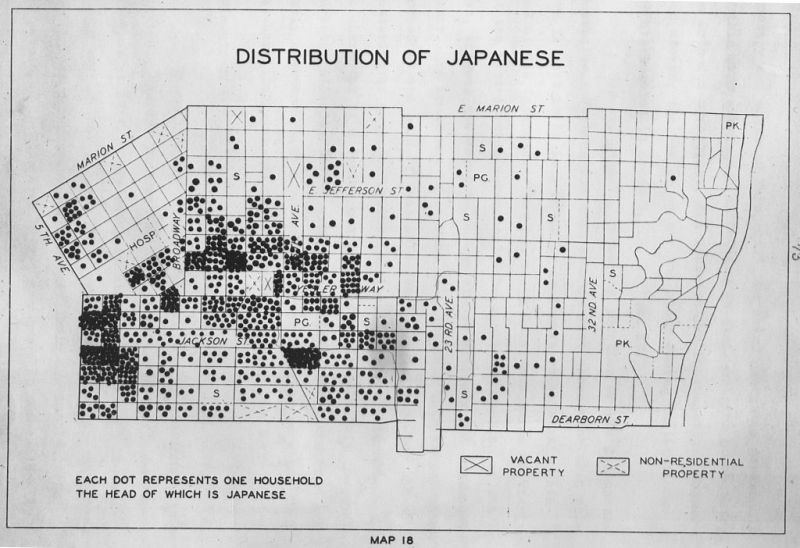 First a sequence by sociologist Calvin Schmid showing where Japanese Americans, African Americans, and Chinese Americans lived in 1920 and 1960 and where Native Americans and Filipino Americans lived in 1960 Another set of rare maps by Paul Hatt shows the residences of racial groups and Jewish families in Central Seattle in 1939. Segregation was first imposed on Asian Americans, who have outnumbered African Americans through most of Seattle's history. Chinese people were tightly confined in Chinatown before that community was destroyed and its residents forced to flee in 1886. Japanese immigrants built Nihonmachi (Japan town) next to the rebuilt Chinatown in the early 1900s and soon became the largest nonwhite group in Seattle. African Americans filtered slowly into the area and initially residential restrictions were loose and informal. 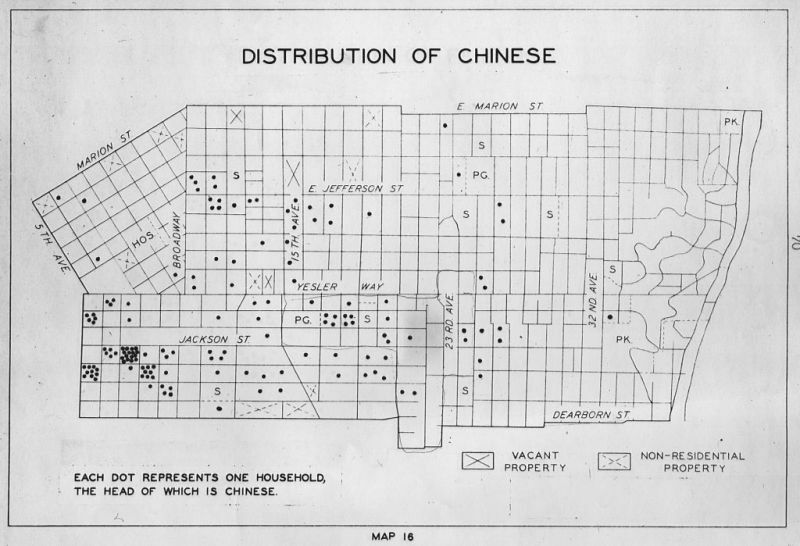 By 1920, as can be seen on these maps, Black families were more dispersed than Asians, but were mostly living in the Central Area, either near Japanese and Chinese residents along Jackson Street or in Madison Valley where William Gross, an African American hotel owner, had bought and subdivided land in the 1890s. In the following decades, new tools of segregation would be used to make the boundaries firmer. Racial restrictive covenants (see database and article) and deed restrictions prevented by Blacks, Asians, and often Jews from renting, buying, or occupying property in most parts of the city and surrounding county. Click to enlarge these 1920 maps. They are from Calvin F. Schmid, Growth and distribution of minority races in Seattle, Washington (Seattle, 1964). 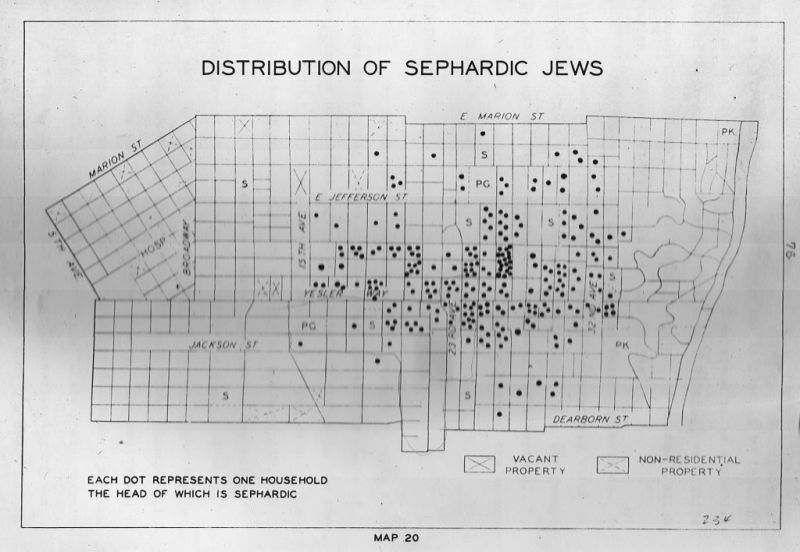 A professor of Sociology at the University of Washingon, Schmid does not explain how he obtained census tract data for 1920. On the eve of World War II, Seattle had a population of 368,302 and for the first time the Census Bureau recorded population data by census tracts, neighborhood clusters of 2,000-5,000 people. Unfortunately, the tract reports designated only three population categories: White, Nonwhite, and foreign-born White. In other reports, Seattle's populations were identified as follows: 4,039 Black residents, 5,778 Japanese, 1,781 Chinese, 1,392 Filipinos, 222 Native Americans, 354,223 White. 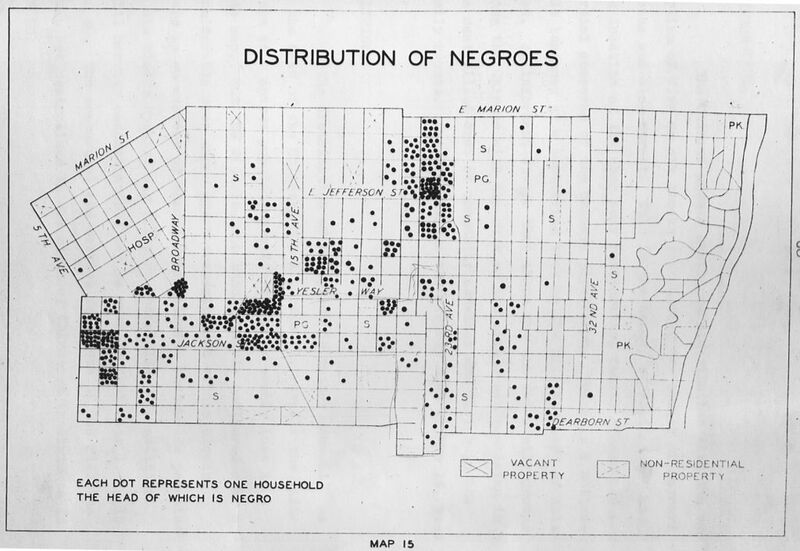 The map at right shows the percentage of Nonwhites in each tract, revealing the evolving shape of the ghetto where people of color were allowed to live. Chinese, Japanese, Filipinos and African Americans shared the Jackson Street corridor that climbed the hill east of Seattle's Skid Road area. Blacks also congregated the Madison Valley tract that William Gross had pioneered. This neighborhood would become the heart of Black Seattle in the decades ahead, home to important churches and more and more African American homeowners and renters. 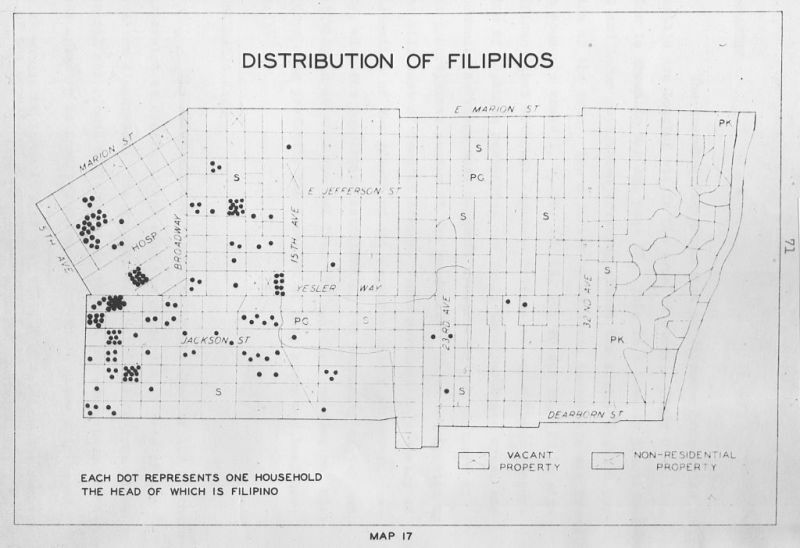 The industrial district south of downtown provided homes for some Black, Japanese, and Filipinos, but foreign-born Whites dominated that tract's population. Sociologist Paul Hatt produced a set of more detailed maps of central Seattle based on a 1939 house to house survey conducted by the WPA. 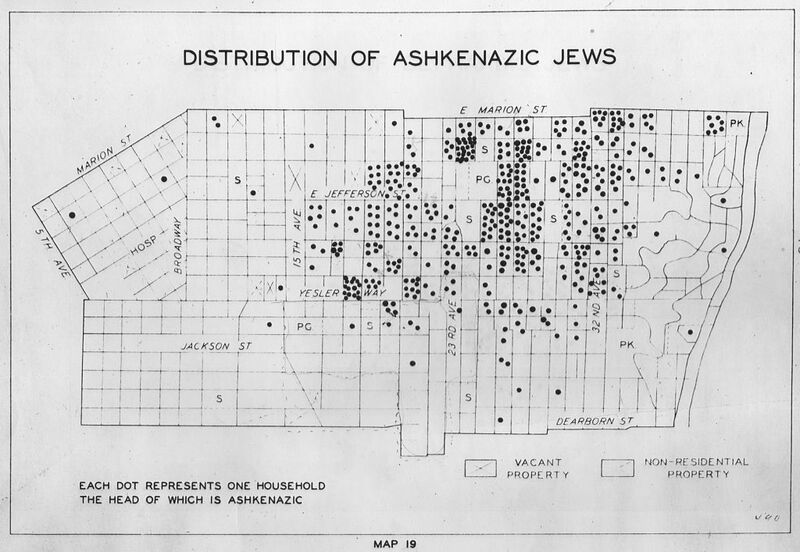 Here are block by block maps of residences for Ashkenazik Jews,Sephardic Jews, African Americans, Chinese, Filipinos, Japanese. King County population had increased 45% in the decade since 1940 thanks to the World War II influx of defense workers and military personnel. The county claimed 732,992 residents in 1950. Despite significant increases in the number of African Americans who had come to help the war effort, the population remained 96% white. Blacks numbered 16,453 and the combined Asian origin population was 12,790. Rules of segregation limited where Blacks, Asians, and Jews might live, enforced by deed restrictions, racial restrictive covenants, and by compounding systems of discrimination organized by the real estate industry and white neighborhoods. And the Central Area had been arranged. In 1942, all Japanese Americans, at that time the largest nonwhite population in King County, were marched off to internment camps. Nihonmachi was extinguished, never to be restored. Many of the apartments and homes provided residence for the growing population of African American war workers. (click maps for more detail). King County population had increased 38% in the previous decade, reaching 935,014 by the time of the April Census. Whites accounted for 94% of county residents joined by 27,805 African Americans, 10,789 Japanese Americans, 4,434 Filipinos, 4,321 Chinese Americans, and several hundred other Asian Americans. The population of Native Americans was also growing, reaching 2,929 and there was a small but uncounted number of Latinos. Tight segregation remained the rule. Discrimination on the basis of race remained fully legal and widely practiced by real estate agents, landlords, white property owners, and neighborhood associations. Nearly all Black, Asian, and Native American families were locked in a triangle of census tracts in the Central District and Chinatown. 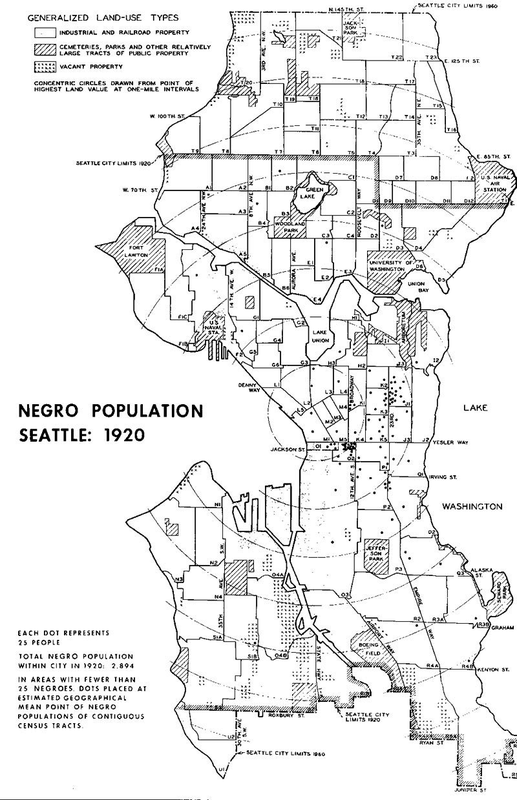 Small pockets of Black residents remained in the High Point housing project in southwest Seattle, but the number living in Sodo and Georgetown area had declined along with the total population of housing in these areas gave way to freeways, warehouses, and industrial sites. (click maps for more detail). King County's population had increased 26% in the previous decade, reaching 1,182,311. Whites still accounted for 93% of county residents joined by 40,597 African Americans, 29,141 Asian Americans, 7,391 Native Americans. The Census Bureau now tried to systematically count people of Hispanic heritage, identifying 3,283. In 1968, Congress had passed a law banning racial discrimination in housing and Seattle's City Council enacted a similar ordinance, but there is little evidence that King County housing markets had responded quickly. 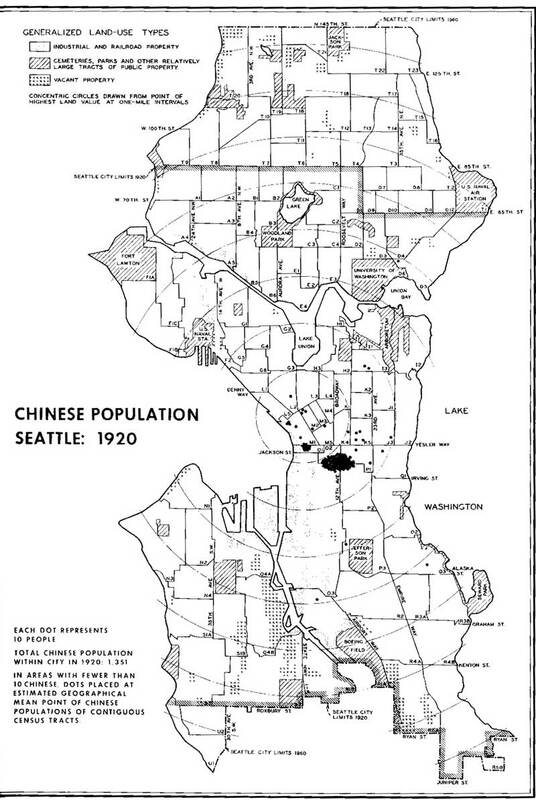 Both African Americans and Asian Americans (especially Japanese and Chinese) were spreading south from the CD into the contiguous neighborhoods of Beacon Hill and Black families had broken the barriers that previous had kept them out of the Madrona District. But North Seattle and the rest of King County remained as racially restricted as ever. (click maps for more detail). King County population totalled 1,266,241 by 1980, a mere 7% increase during the Boeing Bust decade. The county was now 88% white. African Americans now numbered 55,950 and had recently been surpassed by the combined number of Asian Americans and Pacific Islanders at 58,712. There was new diversity in that population as immigrants from Korea, Vietnam, and other Asian nations joined the older populations of Japanese, Chinese, and Filipinos. The southern spread that had begun in the late 1960s continued for both African Americans and Asian Americans and the first glimers of Central District gentrification appeared as the number of whites increased in that area for the first time since World War II. But for most of Seattle and the rest of the county little had changed. North of the ship canal remained virtually all White, as did West Seattle, the East Side, and South King County. (click maps for more detail). King County population had increased 19% in the previous decade to a total of 1,506,373, whites accounting for 84%, a slowly declining ratio. Immigration from across the Pacific had accelerated and now people of Asian and Pacific Island ancestries numbered 118,753, significantly larger than the African American population (76,212). The Hispanic/Latino population was also surging. Only 3,282 in 1970, they numbered 44,286 in 1990. Urban Indians had also been moving to Seattle, more than doubling their population to 17,286 from 1970. The southern diaspora from Central Seattle continued for all of the populations of color. Now all of southeast Seattle from the Beacon Hill through the Rainier Valley was becoming a multiracial zone where Asians of many nationalities, Blacks, Whites, Native Americans, and Latinos shared census tracts, if not every school and neighborhood. Some Asian Americans were breaking barriers in other neighborhoods. In parts of Bellevue, Kent, and far north Seattle, the representation of Asian American residents moved gently past 10%. That was not the case for African American families. In North Seattle, West Seattle, and the East Side, the segregation needle had barely budged. Most of these census tracts claimed 1-2% Black residents, if that. (click maps for more detail). Jumping ahead 20 years, the county had maintained its impressive growth rates, 28% over the two decades. In 2010, the population reached 1,931,249. These decades had registered significant changes in racial distributions. Nonhispanic Whites now comprised 65% of the population. Immmigration had greatly increased both Asian ancestered and Hispanic populations which numbered 294,097 and 172,378 respectively. The Black population had grown too to 116,326, but the number of Native Americans had decreased by 25% in the previous 20 years to 12,931. Residential patterns continued trends that had been established by 1990. Southeast Seattle was more multiracial than ever. This is where most Black families lived, sharing census tracts with Asian Americans, Latinos, and also Whites. In some tracts the split was close to 25%, 25%, 25%, 25%. The small Native American population also distributed through these neighborhoods. Southern King County had much the same multiracial complexion. Meanwhile the eastside had continued its bi-racial trend, shared by Whites and Asian Americans, especially South Asians and Chinese, with Latinos moving into some neighborhoods but very few African Americans. Much of North Seattle, West Seattle, and the wealthy neighborhoods near water had seen much less change. Some tracts remained more than 90% White, many others above 80%, and in these areas Asian Americans were likely to be the only people of color. (click maps for more detail). Note the uneven patterns of desegregation on this sequence of maps. Southeast Seattle and southern King County became the principal areas of desegregation after laws changed in the late 1960s. The percentage of Whites living in these census tracts dropped steadily while Blacks, Asians, Latinos, and Natives moved in. After 1990, some areas on the east side also become more mixed with White percentages dropping below 70%, with the addition of Asian American families. But much of North Seattle remained in 2010 almost as exclusively White as it had been fifty years earlier. The was equally true in Magnolia, Queen Anne, West Seattle, Madison Park, and wealthy, waterfront neighborhoods east of Lake Washington. Before 1970, the Census Bureau did not specify the number of American Indians and Alaskan Natives in census tract calculations. They appeared as part of the "Other race" category in earlier censuses. Native populations had declined precipitously in the 19th century and none of the local tribes had been allowed federal recognition or reservations in King County. The number of indigenous Americans in King County increased slowly as people moved to Seattle from other parts of the state and country, especially after World War II. In 1950, the census counted 1,269 Native Americans. By 1970 there were 7,391 and 17,286 by 1990. Then for some reason the population began to drop. In 2010, 12,931 King County residents identified as Native Americans or Alaska Natives. It was not until 1970 that the Census Bureau introduced a reliable set of questions to count people of Latin American heritage. That year 3,282 people identified as Hispanic in King County and the population was beginning to grow, numbering 44,286 twenty years later in 1990. These maps show Latinos dispursing widely, living in mixed census tracts where they rarely exceed 30% of the population. Southwest Seattle and Renton have developed as areas of some concentration in the last 20 years. Now examine the interactive maps and data that allow you to see the population mix of each neighborhood and filter for particular populations. Click the model interactive map at right. These maps are based on Tableau Public databases and interactive maps created by Anna Yoon, Brian Lam, Gihoon Du, Jiang Wu, and Yurika Harada using data and shape files from the National Historical Geographic Information System (NHGIS). The work was a class project for Geography 469 GIS Workshop taught by Professor Sarah Elwood-Faustino Spring 2017.